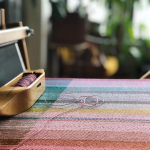 Frenchies’ makes natural products that are inspired by the lure, mystique and love of the great North Woods. 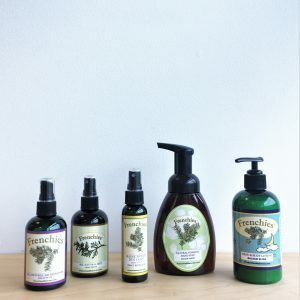 Handmade in their workshop in North Yarmouth using only plant-based essential oils, Frenchies’ Natural Products are free from harsh chemicals and fragrances, making them a healthier alternative to synthetically manufactured products which can be harmful to health and the environment. Frenchies’ first product, Maine Woods Bug Dope, was dreamed up during a camping trip in the North Woods. A common tale of woe for all Mainers; Matt, Lou, and their fellow campers were swarmed with mosquitoes while sitting around their campfire. Matt used a bottle of cedar essential oil to repel the insects, which quickly caught on with the rest of the group. The idea to use cedar-based natural repellent in place of DEET was born, and they began began a rigorous process of research, testing and development with the goal of using cedar oil as the primary ingredient. Frenchies’ Maine Woods Bug Dope hit the market in the summer of 2012, and has since expanded to their line of cedar & balsam products available today, including foaming hand soaps, room and body mists, hand and body lotion, bar soap and more. The Maine Woods Bug Dope continues to be their #1 Best Seller, followed closely by their Balsam Fir Air Freshener, commonly coined “Christmas in a Bottle”. 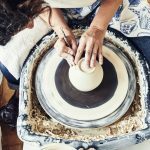 Frenchies’ continues to expand their line of products offered online, and is available at dozens of Maine craft fairs/festivals and trade shows throughout the year. Balsam lovers rejoice! The Center for Maine Craft is pleased to welcome Frenchies’ Natural Products for a pop-up shop in the West Gardiner Service Plaza on Friday, May 25, 2018 from 10am-3pm. Join us to see their full line of products, including Maine Woods Bug Dope & a *new* Lavender and Spruce product line.